What’s New in California’s Final 2017 Climate Change Scoping Plan? 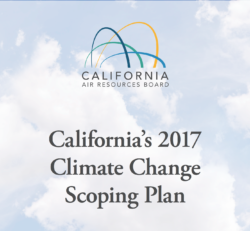 Last month, the California Air Resources Board (CARB) approved the final version of California’s 2017 Climate Change Scoping Plan, a blueprint for reducing Greenhouse Gas Emissions (GHGs), bolstering clean energy, and improving air quality. We previously summarized the proposed Scoping Plan (drafted early last year), and, while the overall framework in the final plan remains the same, some noteworthy revisions were made. First, a little legislative background: In July, California lawmakers passed AB 398, a bill that extends the Cap-and-Trade program to 2030. This bill, along with its companion Air Quality bill (AB 617), provides legislative direction for the Scoping Plan and extends the state’s Cap-and-Trade program to 2030. In addition to clarifying the role of Cap-and-Trade, AB 398 enacts changes to the carbon market by establishing a price ceiling, price containment points, and limits to the overall quantity of offset credits. The bill also identifies legislative priorities for allocating auction revenue proceeds and designates Cap-and-Trade as the mechanism for reducing GHG emissions from refineries. Now, back to those noteworthy revisions we mentioned. A couple of key updates relevant to the transportation sector stand out in the final version of the Scoping Plan. The most significant of these is the removal of the “Refinery Measure.” The proposed Scoping Plan Scenario included a 20% emission reduction for refineries by the year 2030. The measure required new efficiency benchmarks at the refinery level by way of upgraded technologies and processes. Under the new Scoping Plan Scenario, however, refinery emissions continue to be regulated under the Cap-and-Trade program without the added industry-specific reduction. The removal of the refinery-focused emission reduction measure created a slight shift in the plan’s modeling of cumulative GHG reductions from the Scoping Plan Scenario. The proposed Refinery Measure was estimated to account for a 30 MMTCO2e reduction from 2021 to 2030, with 459 MMTCO2e of reductions from prescriptive measures (including the LCFS), and Cap-and-Trade needing to deliver 191 MMTCO2e in reductions for a net savings of 680 MMTCO2e. The new analysis estimates that the Cap-and-Trade Program will achieve 236 MMTCO2e, while prescriptive measures add up to reductions of 385 MMTCO2e, resulting in total cumulative emissions reductions of 621 MMTCO2e, 59 MMTCO2e less than originally proposed. In addition to these important modifications, the final plan makes clear that the United Nations’ 2016 Paris Agreement, which aims to limit global warming to less than 1.5 degrees Celsius, is the framework for California’s environmental protection plan. Despite President Trump’s withdrawal of the U.S. from the accord last year, California reaffirms its commitment to fighting global warming, and meeting the Paris goals, in its final Climate Change Scoping Plan.